The crapcan world has a way of flipping road-car convention on its head. Maybe endurance racing is unforeseen torture test for most makes and models, but seemingly bulletproof drivetrains like the Honda D-series engines or the Toyota 4A discover new and innovative ways to fail at every single race. In this same vein, the 1980s sports car ubermensch Porsche 944 has earned a reputation for spending more time on jackstands than on the track. 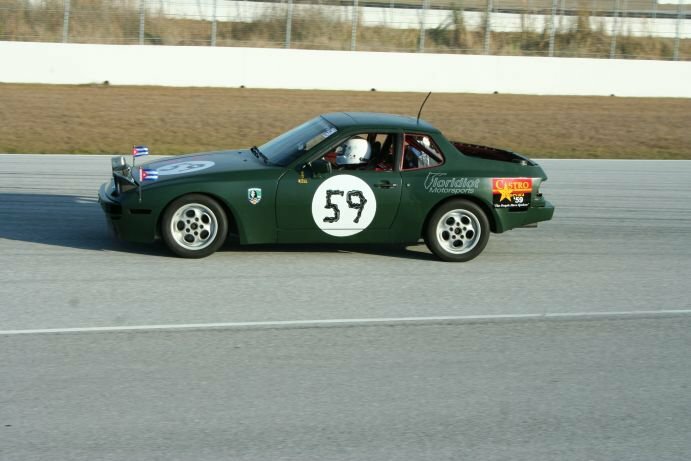 However, the Floridiot Motorsports 944 crew has found a sweet spot with the car and run five races on the same drivetrain, never finishing lower than 20th place in any of them. 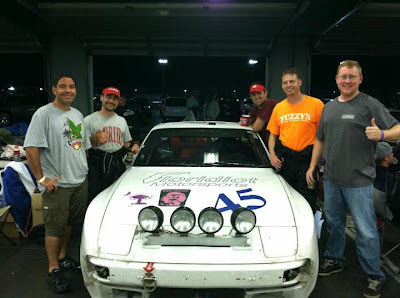 Their success has been no stroke of luck, though; the six-man team of Jason Hickman, Greg Laster, Brian Moody, Santiago Ruiz, Chad Doering (Crew Chief), and Frank Suarez (Head Mechanic) put in countless hours of preparation to keep the 944 demons at bay. If they can just figure out the driving part of it, they'll be a pretty good bet to take home the first Porsche victory in crapcan racing. The Floridiots have essentially remained the same team since its inception, but the car's current livery pays tribute to two team members who recently passed away: Bernie Hickman (Jason's father, in whose shop the car was largely assembled) and Khalil Mohmed (a good friend who built Formula SAE cars with several team members at the University of Florida engineering school and who died racing motorcycles in 2010). The Rusty Hub spoke with Floridiot's Brian Moody just a week after the ChumpCar World Series race at Daytona International Speedway on the day before Memorial Day. After the jump, read his thoughts on 944 reliability, sponsorships, and the Esprit de crapcans. The Rusty Hub: Why don't you start by telling me about Daytona. How was it? Brian Moody: Daytona was ridiculous. You know, after we ran Sebring, I felt like the racing world was a little bit smaller, having run such an amazing historical track. Daytona kind of had the same experience. The Rolex 24, the 12 hours of Sebring, and the 24 Hours of Le Mans have always been the Triple Crown of endurance racing, so now I've done endurance races at two of those three tracks. That's just kind of cool. Sure, it's in crappy $500 cars, but not many people can really claim that. 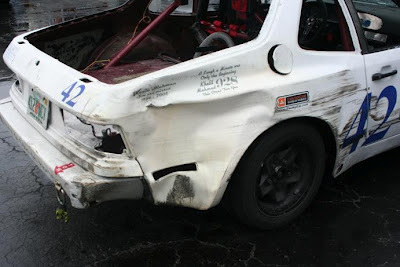 To be able to do that on the cheap, it's just amazing what ChumpCar and [the 24 Hours of] LeMons, as well--both of those races were ChumpCar--but LeMons is on the same track. Right--the Exhibition Class--there was one of those there that finished ahead of us. So without them, we were 14th. If you include them, we were 15th. What did you do to finish there? That's like the top 10 percent--that's pretty impressive. "How did you pull that off?" I guess, is the question. We have a pretty consistently well-running car. Everybody complains about the 944 being horrendously unreliable and blowing engines left and right; we've had very little problems with the car. A lot of it comes down to we spend a lot of time troubleshooting little things. The forums are really helpful; I know the Miata guys will probably vouch for that, too. I'm actually battling that right now. I just bought a Miata that doesn't run and I'm on the Miata forums trying to get that running just as a street car. But yeah, prepping the car and we get our oil analyzed after each race. We send that off to a lab just to make sure we don't have any weird wear problems. We've just had a ton of great luck. Yeah, I think the Miatas' are considerably smaller than that. So even though they're getting better mileage than we do, they still have to stop more often. That's my understanding anyway. I had no idea it had a 20-gallon tank. So do you only have to refuel every other stop? No, we refuel every stop, because we can't get two stints on a tank of gas. But we'll burn somewhere north of three-quarters of a tank in a two-hour stint--a little less at Daytona, because I don't think we had any stints that didn't have a little rain. How was driving in the rain? Well, as Garth Stein would tell you, there's an art to racing in the rain. That's completely true. I think our car handles incredibly well and we gain an advantage over the horsepower cars when it starts to rain. There are a lot of cars out there that don't handle as well as we do but have a ton more power so they walk away from us on the oval or in the straights and we kind of catch them in the corners. As soon it starts raining, we kind of get an advantage. I definitely think a lot of rain in Daytona helps us. One thing I read about the 944 was that Porsche, when they first released it, claimed that the top speed was 130 miles per hour. You guys were probably pushing that, I'd guess; is that right? Yeah, Jason [Hickman] on our team did some quick calculations on that just with our gear ratios and I think we run out of gear at about 130. 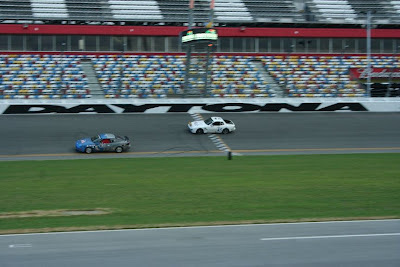 And coming through the tri-oval at Daytona, we were at the top of the range in fifth gear. So I think we were about 130 at the point in the braking zone for Turn 1. And people were passing you even doing that? There were a couple cars. That Mercedes was ridiculously fast and if I didn't get a good run out of the Bus Stop, we might get passed on the oval. There were some faster cars than us. It sounds like a hell of a lot of fun, driving at a gigantic place like that. Yeah, the whole experience...driving the race is amazing, but just being there is almost just as good. We went to a LeMons race in Baton Rouge before we started. We bought a car but we hadn't put it together yet. 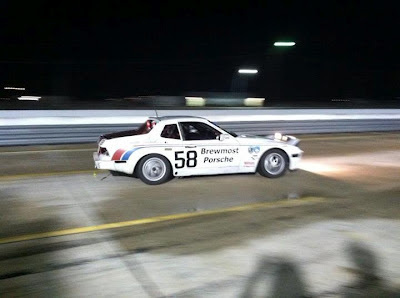 We were getting set up for the 24 hours, the "North Cuba" race, in Palm Beach. So we went out there to see just what we were getting into. We'd read a little about it and we thought it seemed like it would be a lot of fun, but we had no idea how full-on crazy it was. We really figured out when we were there that we had found our people: people just as insane as we are. This is going to be a ton of fun. That really boosted our team morale--not that it really needed it--but that really kicked it into high gear getting prepped. Why don't you talk a little bit about the theme? Well, we've actually...theme is much bigger in LeMons than ChumpCar. For the first race--the North Cuba race--somewhere along the way, those guys tried to rename the race. They were getting some flak from the media or something for having it called "North Cuba." Well, quite honestly, that kind of pissed us off. So we decided to go full Cuban Revolution: We painted the car military green, we put on olive drab and grew our beards out, smoking cigars all weekend. We painted the car up and we were car #59 for that race. I actually boned up on my Cuban Revolution history for this one. We were car #59 because 1959 was the year the Cuban Revolution took hold. We brought tons of bacon for everyone, because it was New Year's headed into 2011, which was the 50-year anniversary of the Bay of Pigs invasion. It just went on and on--the Cuban Revolution--it all just kind of fell together. We were kind of hoping we would offend at least a few people, but that wasn't the case. Everyone thought it was hilarious. We got one of the guys from our crew--I'm pretty sure he is of Cuban descent--he thought it was hilarious. We ran into a few other people in the area that are Cuban and they all thought it was funny. Most Cuban people who live here in the States, they saw the humor in it and they're not pro-Castro. They don't like Fidel and Che Guevara and that whole thing. And what everybody thought was going to be offensive, it's just funny. That was our first race. The next race we went to Carolina Motorsports Park up in Kershaw, South Carolina. That race happened to fall on May 21, 2011, which is only significant because--I don't know if you remember--that was when some fringe religious group thought was going to be the apocalypse. 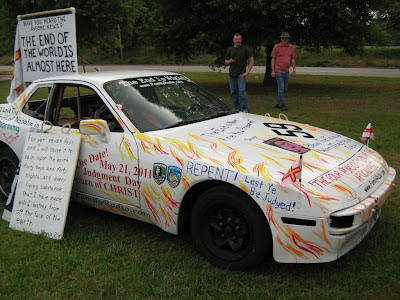 So we ran with that and we completely painted the car with flames all over it: "Save the Date: Christ is returning," you know, all this other stuff. So we covered it in vinyl graphics and paint; just "Repent" and all this religious stuff. That was the easiest one to do because we just went straight to their website and pulled all of that and painted the car just straight with that. We got penalized and one of our penalties for running off the track was Greg [Laster] and I are Saran-wrapped to the roof of the car with bullhorns while Jason drove us around the paddock area and we had to preach the coming of the apocalypse to everyone. It was hilarious; there's actually a photograph of us doing that in the September issue of Red Bull Magazine. They did a fantastic job of covering the race, as well. And that day when the apocalypse was supposed to happen, you know, of course it didn't. So then that night, we completely washed the car because what no one realized was that it was all temporary paint. So we stripped it completely off and underneath it, we had the Brewmost Porsche theme, complete with red and blue stripes, complete with car number 59, I think, maybe 58...I don't remember. So then we came out the second day completely re-themed. ...and pretended like nothing had ever happened. You ran with the Brewmost at Sebring also, right? We did. We just stuck with it because we didn't really have any good ideas for a new theme that would be worth the effort. ChumpCar is not big on themes. Brewmost, we'd only run for half a race so we just said you know what, we'll stick with it. I don't feel like painting the car anyway; run with it. And then after that, we were kind of tired of the Brewmost thing. We wanted something new and fresh and we also noticed that people would try to find us on the web or Facebook or whatever and they'd try to search for "Brewmost." And they wouldn't find us, so we just went with our own livery: "Floridiot Motorsports." It's huge and noticeable; I guess that's the point. Yeah, I kind of went big with it hoping people would recognize us. Where did the car come from? What's the story behind the car? We found the car up here near Jacksonville--most of our team is based out of south Florida and I live up here in Atlantic Beach--and we found the car on Craigslist up in kind of the middle of nowhere up in Nassau County. A guy was trying to restore the car, didn't know much about it, but he had the 944 and a 924S as a parts car. Neither one was running, so we actually picked them both up for $400 each. Among other things, it had a broken timing belt, which is pretty common on these cars. Is it an interference motor? Oh, gotcha. So that's bad news then. So you just kind of pieced together a car out of the two? Yeah, I think we have a head that we found in a junkyard and we had to clean up the inside. You know, we had to clean the pistons. They got hit by the valves. So it's just a normal 944? It's not an -S or a Turbo or anything? What's it like to drive on the track? The car is very forgiving; it's a very neutral car. It takes a little getting used to when I get into from my street car just because you sit so low in the car. It's not the greatest visibility-wise, but all things considered, it's been a great car. And you already mentioned how 944s are considered kind of fragile; you haven't had any major failures--I'm sure I'm jinxing you now by saying this--but beyond doing oil analysis and stuff like that, what's the typical race prep for the car? For us, race prep involves a lot of drinking beer, replacing brakes because we have had horrible luck with brakes. I say that...up until Daytona, we did. I actually think we have them sorted out now. 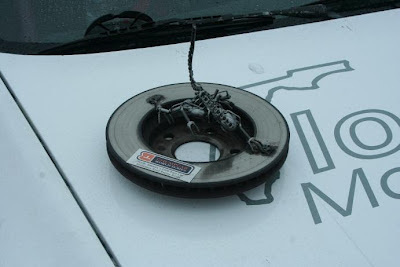 But we've had horrible braking issues. But the drivetrain itself has been rock solid; it really doesn't require much from us: basic maintenance. We obviously do oil changes; we run fresh oil for the race. A lot of that, you know. Make sure our brakes are completely bled, but that's usually because we've put new pads and rotors in and stuff like that. Is this going to be the first 944 to win a crapcan race? Hmm...We certainly have all the pieces in place. I've said before if we had more horsepower, we'd be in much better shape due to us having great handling. But I'm going to go ahead and retract that; the car's good. I think we have enough horsepower to make this happen. Our problem is driving. A lot of the guys who do ChumpCar and Lemons are otherwise--I guess you'd say--seasoned amateur racers. 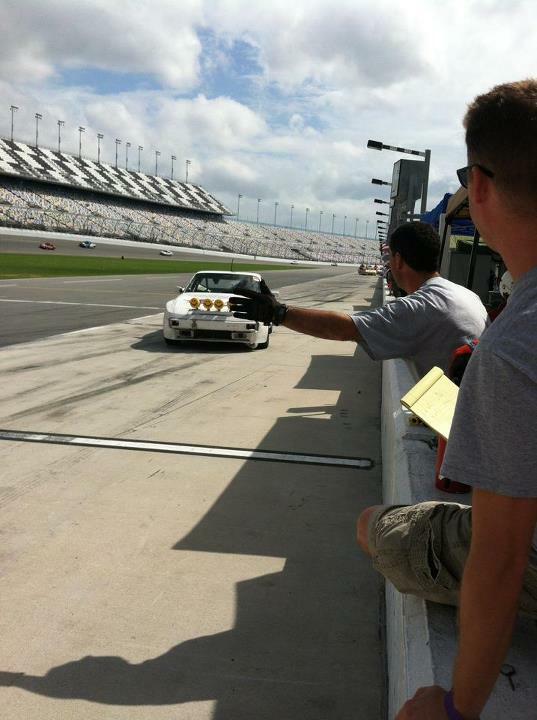 A lot of them come from SCCA or Spec Miata and they have a lot of experience and they're just better than us. Within our team, we have some variation on driver skill level, but on the average, we're just not very good at race car driving. Fair enough. So you guys were basically all novices when you started? That's correct. I think if you took our team and our prep and you went into a race where we were the crew and we had a few ringer drivers--not professional but good racing drivers--we would stand a really good chance at winning one of these races. Of course, a lot of it is always going to come down to luck. Yeah. There's definitely a luck element in it, just hearing stories of people who have won. Just random fortuitous stuff. Sure. You pit at the right time when a caution comes out or something like that. It's a lot of the same analogous stuff to professional racing. Most of the same rules still apply, as far as getting lucky when you time things. What would you say to somebody who sees crapcan racing from afar and thinks "That it isn't racing?" Because I seem to get that impression from a lot of people. I'm seeing less of that. What I'm getting more--I never really saw a lot of that but I'm not really in a community where a lot of people would look and say that what we're doing is just silly and isn't racing--what I'm seeing more of is people contacting me through the web wanting to know how to get into it. And I know what you're saying when you say that it might be viewed as "not real racing" and to those people, I guess I would have to say "Well, that's your problem, not mine." I'm not here to prove anything to anyone who looks down on what we do. I've never had so much fun in my life and I'm not going to stop doing it and I'm not here to impress anyone. And as far as people that want to get into it, I think you need to find a few people who are as crazy as you are and go for it. As far as racing goes, it's as cheap as it gets. There's no such thing as "cheap racing," but just do it. Buy a piece-of-crap car, put some decent brakes in it, sweet-talk a welding shop into putting a rollcage in it. 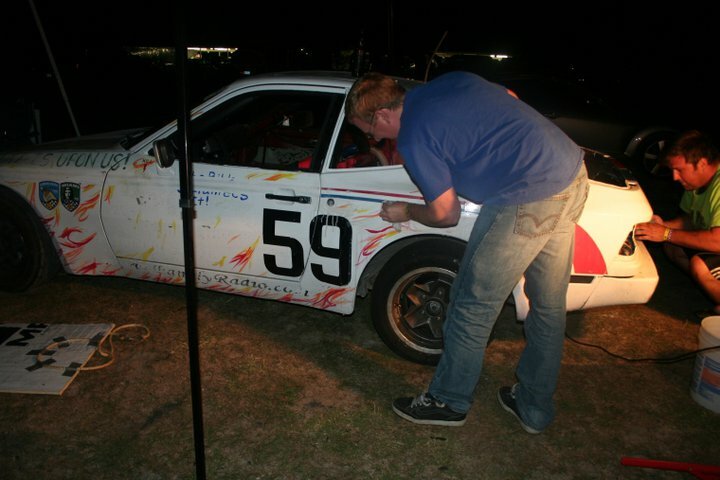 It doesn't have to be great; you just have to pass tech, spray-paint some numbers on it, and go racing. How big was it--you mentioned going and seeing a race--how important was it for you guys to see what you were getting into ahead of time? I think that, in hindsight, it didn't really matter much, because we just confirmed what we thought we were looking at. If we'd have found out that it was very, very much different, I'm not sure it would have discouraged us. We just wanted to make sure that we were...oh, I don't know...we wanted to verify for ourselves that this was worth spending the money on and it was gonna be as fun as it would be, I guess. One of the things you and I talked about briefly over email was pursuing sponsors and I know you'd said that didn't quite pan out the way you thought it would, but you learned a lot. Could you share what you've taken away from that experience? Sure. There's a couple of things. One way I'll answer that question is kind of what I've seen with other teams with their sponsorships and it's kind of confirmed what I sort of suspected: that a lot of sponsorships come down to someone in the family or someone on the team who owns a business is going to put their name on the car. Sort of this promotion but they're paying for it anyway because it all comes from the same pot, money-wise. There's also automotive shops that will mount and balance your tires for free in exchange for throwing their name on the car, that kind of stuff. So there's a lot of that stuff going around with sponsorships. As far as just straight-out sponsors where you approach a company and offer to put your name on the car in exchange for a check to help pay for the expenses of racing, it's kind of difficult because this is still not yet mainstream. It's not on TV on Sunday; when you sit down and turn on the TV, you don't see this kind of racing. There's not a lot of exposure. The people who go to the track are involved with it, for the most part. So as far as a return on investment, this is a really hard thing to put together. But it comes down to: Is it worth $5,000 to print your company name on my car? Of course not. Is it worth $20? Absolutely. So somewhere between those two numbers you'll find the appropriate, I guess, market value for putting your name on a crapcan. So it's a matter of finding that number. And then: Is that number worth doing? If that number is closer to the $20, I can't even put the name on there for $20; I've got to repaint the car. I do vinyl graphics for everything, I do everything myself, but it's still materials and it's still time. So if the sponsorship isn't even worth the amount it takes to put the sponsorship on the car, it's of course pointless. I've got a friend who owns a couple of restaurants here in Jacksonville Beach and we talked about putting one restaurant on one side of the car and the other restaurant on the other side. Part of what I wanted to do was paint the car with sort of a Memorial Day theme--you know, American flag-type stuff--and the big thing would be bringing the car to the restaurant for the next--the Daytona race was on Sunday--the following day was Memorial Day. I was thinking we could bring the car to the restaurant and people could get pictures taken with the car, a real race car sponsored by the restaurant. Put the kids in it, everybody would have a good time. And there's value in that. The other thing is--especially if we're running a track like Daytona--you can get your famous photographs of the cars crossing the start/finish line at Daytona with, you know, the "Daytona" painted on the wall in the background. You have these photos, you can put them up in your restaurant or whatever; it's just cool. It's a novelty sort of thing where you're not getting a direct return on investment advertising-wise, but you have access to these other sorts of just, I guess, novelties that you'd get from sponsoring the team. It seems like a tough path to follow trying to find sponsors for any grassroots racing, because not much of it gets much coverage. Sure. In a lot of way--especially if you don't know who you're talking to when you're talking to about a sponsorship--they probably don't even know what it is you're sponsoring. This is somewhat easier talking to a friend of mine because we're friends; I never shut up about racing and about the LeMons and ChumpCar thing so he's at least pretty aware of what we do. Changing gears completely: You guys won the Spirit of ChumpCar Award. Was that at the Palm Beach race? That's correct. I think they call it the Spirit of ChumpCar award. Just for being generally awesome or something to that effect? [Laughs] I kind of added that myself. I wasn't entirely sure what that was about so I decided to name it the "Spirit of ChumpCar Award for General Awesomeness and Sportsmanship," I think. Basically, what I gathered was it's for sportsmanship. We helped out a few other teams. We knew the local area, we knew where the speedshops were. We went to the organizers beforehand to let them know where they could send people who, you know, forgot a glove or a head sock or something like that. And we helped a couple other teams, just odds and ends here and there: tools, debugging wiring issues. You know, anywhere we can help another team, we would love to. That's why we do this and they gave us the award. The impression I got was they feel we're one of those teams that embodies what they're trying to capture. I don't know if that's the right word; we embody what they're trying to put together with this whole ChumpCar thing. Just from being at races and running them, it seems like every race, just about everyone you run into is willing to lend a hand with anything. Absolutely. I've run into very few teams that were overly competitive or that drive aggressively to the point where it's a dangerous issue or dangerous situation. That's very rare and I've never run into a team that wasn't willing to help out. Even when they're down on their luck, they're welcoming to people coming into their pit area and asking questions. You know, someone's got a blown engine, everyone wants to see. I've never seen a team that was so upset about it that they weren't still having a good time. You guys have run two 24-hour races, is that right? Yeah. Two 24s in Palm Beach. How does that compare to the non-24 hour races? Is there a different approach to it or how do you go about that? I wish they would all be 24 hours. It's just such an experience and I love posting to Facebook when the sun's coming up: "We're still racing; I don't know what you guys have been up to the last eight hours," something like that. Really, the only difference is that you have to try and get a nap here and there, which doesn't really work that well. And it's not really so much of a concern; I've never gotten sleepy inside a race car. You're running on adrenaline. The aftermath of it is a little more taxing. Of course, it's more expensive; you spend more on fuel. But at the time of the race, it doesn't seem that much more taxing. Afterward, it's that much cooler that it was a 24 hour. Is there any kind of sense of urgency during 24-hour races, like if something goes wrong? You know in the two-session races you get an overnight period to fix whatever may need fixing and you don't get that. We've only run one two-session race and actually that was kind of a mad rush to get the car re-themed because that took a little longer than we thought. We were camping in South Carolina and it was unbearably hot, so we were already not able to get the best night's sleep because we were camping at the track. So it was kind of a mad rush to get everything re-themed and ready for the next day so we could get a couple hours' sleep. And of course, we had braking issues so we had to change the brakes. If there was a new team that came to you just asking some general advice, what would you tell them? Think about the car you're going to bring. Look at what seems to work and what doesn't and what's going to fit your goals as a team. If you want to win the race, there are certain cars that typically do well. But if you want to get everyone's attention while you're there, bring an old El Camino or something like that. You know, an old Fiat or Alfa Romeo. So the car really needs to fit what you're trying to do as a team. Look at Speedycop and the Gang of Outlaws or whatever they call themselves: They're always bringing something weird and different. I don't think they've won the LeMons races--maybe they have--but they're more memorable than probably any other team, you know with the pop-up camper Suzuki X-90 that they ran recently. I'll never forget when they brought the--I think it was--1979 Bonneville on 24-inch wheels. I was sure he was going to snap an axle but it survived. There's a part of me that thinks that's what this is all about. I mean, why would you bring a Miata? 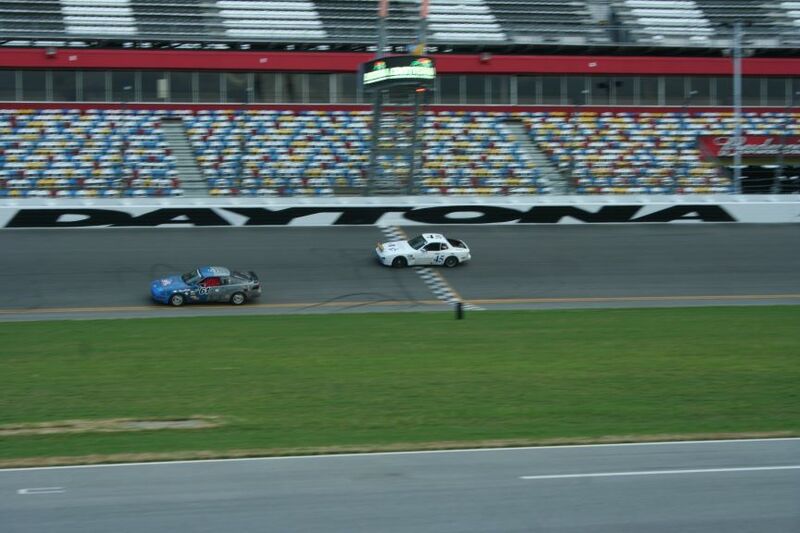 You can race a Miata anywhere and afterwards so what? You raced a Miata join the army--there's an army of Miatas out there. But who brings a Pontiac Bonneville on 24-inch wheels? That's what this is about. I've been trying to capture that in a sentence or two for a long time and I just haven't been able to. It's a weird thing. There's just a certain amount of creativity, particularly with regard to engineering that they seem to encourage, that a lot of people seem to enjoy. I've described LeMons racing as Mad Max meets Monty Python on a race track. [Laughs] That's surprisingly apt. I like that. So what's next this year for you guys? We've debated Virginia International Raceway, the VIR race, but the dust hasn't quite settled from Daytona. Right after any race, we're always kind of looking around the next race, regardless of where it is, because we're amped up and we have so much fun. The reality of it is it's a financial burden; we can't race every weekend. We'd love to, but there's just no way we can afford it. We really, really don't want to miss Sebring in September. That was a really fun race and we want to go back. It's also fairly local; it's right here in the middle of the state, so most of the people I know--just friends of mine--are more likely to come to a race that's only an hour-and-a-half, two-hour drive. And that makes it so much more fun, when I can convince friends of mine who aren't really into racing to come out and see what this is about because then they realize this isn't just about the race, this is about a party. And we have so much fun at the track. Brian Moody: Laguna Seca. That's an easy one. I want a photo of me in my rubbish 944 getting Corkscrewed. (2) What are some of the strengths and weaknesses of the Porsche with regard to what may or may not be the burgeoning zombie apocalypse in Florida? Let's see...weaknesses. The weakness of our car is the drivers, but it's also got that open hatch, so if we end up with the typical problems Porsches have, the zombies can get in through the hatch and that's no good. But I guess we're still better off than the Miatas. The strength of that car is that it's rock-solid West German iron. That thing was forged in the '80s and it makes a nice "chunk" sound when you close the doors. I think we could probably drive through a lot of zombies before we started wearing it down. (3) The third question is actually about the designer--the guy who designed it in the '80s--his name was Harm Lagaay. What country is he from, do you think? I can spell the last name if you want; it's L-A-G-A-A-Y. What country is he from...I'm stumped because now I'm trying to think of the design of the car and what does it look like. I'm guessing he's not German; that would be too easy. And the name's not giving me a lot. I'm going to guess one of the Scandinavian countries and am just going to leave it at that. That's a pretty good guess. He's from the Netherlands, so you're actually in the ballpark. (4) In 10 years, what do you think will be the crapcan of choice? That's a good one. What's going to be worth $500 10 years from now that's basically current market or just a few years old? I'd like to see more Subarus out there but I don't know that they're going to fit that bill. Yeah, that's kind of a problem with those cars for this sort of thing. Man, I'm kind of stumped here. I think the Miata is always going to be strong and we're going to start seeing a lot of the second generation start to crack into it...cheap, reliable performance that's on the market right now; what do I see a ton of? Might start seeing Minis--Mini Cooper--they make decent power. They're small, they're lightweight. Front-wheel drive has not proven to be a problem in this kind of racing. (5) In fewer than five words, what does your 944 sound like? It sounds fantastically awful. It's--you know, actually, it doesn't sound that bad. When it's under full load, it sounds like the car is trying to eat a chainsaw. 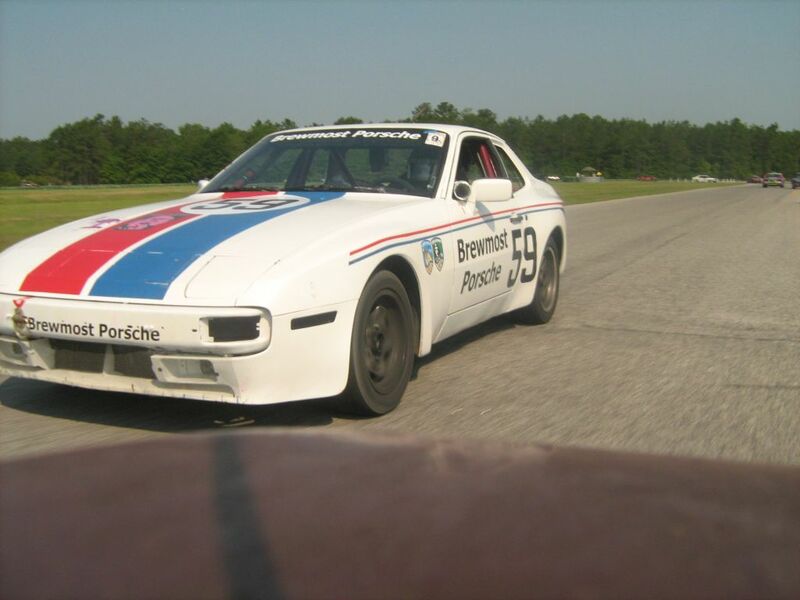 There has been a Porsche win in crapcan racing: the 944 of Pferd won a 9.5 hr race against a 29-car field in the November Harris Hill event. Thanks, Craig! ChumpCar results from seasons past have been hard to find, at least ones with the car types. I've looked all over the Web for some kind of ChumpCar archives with car information because I actually want to keep a running tally of the winners by make and model. But I've been told by a regional director that no such central ChumpCar database exists. Do you happen to know if someone in the community might have a personal archive of results?